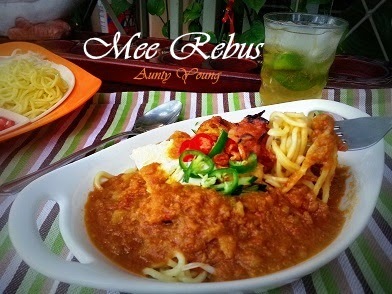 "Mee Rebus" literally means boiled-noodles. The dish is consists of yellow egg noodles with spicy potato gravy and garnished with hard boiled egg, spring onions, potatoes, green chilies, fried bean-curd and bean sprouts. During Cheng Meng, after visiting my mother-in-law's grave, my family usually pop by a Malay store to enjoy its delicious Mee Rebus. Seeing how much NaNak enjoys it, I promised to learn to cook it for her. And thus, my first bowl of Mee Rebus came about. Compared with the Malay store's, this recipe had thicker gravy. However, with its delicious mix of fresh ingredients like beancurds, cucumbers, bean sprouts and chillies, it's another yummy dish. All that's left is to fix the thickness of the gravy and it'll be even better! some corn flour water for thickening. 1. Heat oil in a wok, saute the dried shrimp till fragrant, then add in ingredient(A). Saute until you can smell the chillies' aroma. Add in mashed potato, stir well. 2. Add in seasoning, stir well. 3. Add in 1600 ml water, lemongrass and tau cu(bean paste), cook with medium flame for 15 minutes or longer. 4.Add in corn flour water and continue to cook for another 15 minutes and the gravy is done. 5. Boil the yellow noodles and bean sprouts, then put them in a bowl. Garnish them with a suitable amount of garnish ingredients and scoop the gravy onto them before serving. terima kasih banyak banyak ! Na Nak makan 2 mangkuk sekali gus! Hi Aunty Young, you're very hardworking but it's worth the effort. 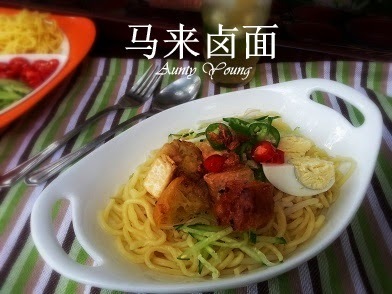 This my favourite noodle quite similar to my easier version Mee Java. I like this noodles sourish and sweet. Oh! You have Mee Java recipe? I am going to try it ,sure will drop by your blog to "korek" it out,thanks for informing me . Hi Aunty Young! 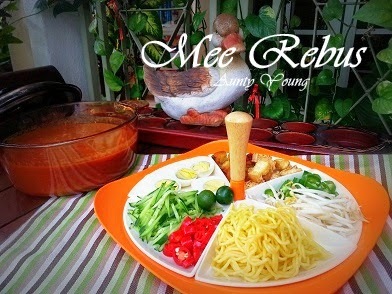 I love mee rebus. I can sapu two bowls in one sitting. And I keep complaining I cannot lose weight hah...hah....! Phong Hong, me too, when I smell the delicious food ,always forget about dieting,and straight away makan first, then complaining ......................ha..........normallah !! Your post mee rebus has made me stopped by to visit this post as I love mee rebus. I can see that this look absolutely delicious .... I love food that is homemade. 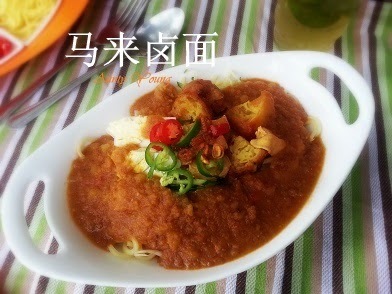 I am glad that you like my mee rebus. it is delicious. All that's left is to fix the thickness of the gravy and it'll be even better!